When Chocolate in Context announced the theme for this month's Sugar High Friday (the sweet lovin' food blogging event that attracts dozens of participants from around the world) as 'naked chocolate' (okay, okay, they really called it 'raw chocolate'), I looked at the just-peeled raw cocoa beans on the counter and thought, How lucky is that? Say hello to Chocolate Sauerkraut Cupcakes, made with my very own cocoa powder. The whole cacao beans came from Global Foods, my very own neighborhood international grocery, for a couple of bucks. The beans came from El Salvador and the instructions were minimal. "To prepare home made chocolate: Toast and peel the seeds. [oh! toast! I missed that until just now]. Add cinnamon and sugar to taste. Ground [sic] all ingredients." It took forever to peel the beans -- but then again, it was perfect for dual-tasking in front of the TV. And when I ground the beans in the food processor, the result was more like grainy nibs of vanilla bean than a fine powder. Will I grind cocoa beans regularly? Probably not. But it was fun, just once. This is a public service announcement for food bloggers: My friend Ann's husband is a firefighter in north St. Louis and forever, now, she's encouraged me to take just-baked cookies and cakes and all sorts of food to my local firehouse. So last week, with both cookies and banana bread either going to waste or going to the firehouse, I made the first delivery to Firehouse Number 1. The reception was so warm there's no question I'll be back often. And it's about time. You see, there's a special spot in my heart for the Kirkwood fire people, especially the EMS folks who were completely totally absolutely undeniably wonderful when my Dad and I were doing hospice for my Mom. So it's been five years, but finally, I feel like I'm saying 'thank you' properly, with cookies and banana bread and today, cupcakes. And um, what about the stinky sauerkraut in the cupcakes? Well first, the sauerkraut isn't stinky because it's rinsed. But second, the sauerkraut kind of melts into the cake, so you really don't even know it's there. It's an old trick, putting sauerkraut into cakes, and if you've got some leftover say, from this great pork chop supper, why not cupcakes? It's good for novelty, if nothing else. And I bet that even Freddie would like it, especially since he thinks colcannon is heaven. FROM THE ARCHIVES There are other recipes using vegetables in Desserts & Baking in the Recipe Box. My favorite is the Wine, Beet & Fruit Salad. PRINT A RECIPE! Now you can print a recipe without wasting ink and paper on the header and sidebar. Here's how. Rinse and drain the sauerkraut, then run through the food processor to make fine. Set aside 2/3 cup for the cupcakes (the rest will be great in Saturday Soup). Cream the butter and sugar til light and fluffy, add the eggs and vanilla and beat till well incorporated. Beat in the sauerkraut. In a medium bowl, fluff the dry ingredients. Add to the batter in thirds, adding the water between additions and beating only lightly each time. With a wooden spoon, stir in the chocolate chips. 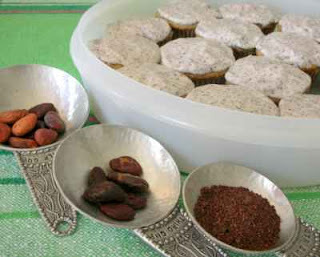 Fill muffin tins with cupcake liners and fill with batter using two spoons, one to scoop, one to scrape. Bake for about 20 minutes or until a toothpick inserted in the center comes out clean. Let cool for 5 minutes and remove from pan. Let cool completely before icing. How intriguing these are! I see how Ruth's cookbook is inspiring. And I'll have to make a trip to Global Foods just to see those cocoa beans. I have a feeling I won't be peeling any at my house this week. I ate sauerkraut all weekend - as a 'raw' salad, and then sauteed with some ginger and chilli - quite a change from our traditional and much loved sauerkraut soup. Not sure I'll try this one - it sounds way too exotic for me - but I admire your adventurous culinary spirit, dear Alanna! I am totally fascinated by this idea. Does the sauerkraut add any noticeable flavor, or does it just make the cupcakes moister? Karen ~ I thank you for lending me the cookbook, I'm ordering my own copy! Pille ~ I really want to try a sauerkraut salad. And soup?? Good! Danielle ~ It's hard to say, actually. The chocolate flavor is strong, esp w the chips added. Maybe the firehouse guys will chime in with their thoughts!! Sauerkraut in cupcakes? That's a new one for me! I'm with you on doing some things once - it can give you such a different appreciation for some things. Um sauerkraut in cupcakes - well once, then I'd know from experience! Seems like I read a recipe for sauerkraut cake somewhere- I'll have to look for it. "Spread the Bread is a "community" bread-giving initiative that encourages people, especially our youth, to bake bread-any kind of bread- to honor our heroes and to help those in need. It was officially launched after September 11th, as a simple yet effective opportunity to bring kids back into the warmth of the kitchen during a difficult time, talk about the world around us , and to nurture their innate generosity by promoting an appreciation and concern for others. Word spread and so did the bread...hundreds of thousands of loaves of bread spread." Isn't that a cool thing? Some of our local Girl Scouts are going to be baking bread for the local Meals on Wheels. But taking it to the firehouses is just as cool and idea. Thank you for that! I get sauerkraut in my vegetable bag almost every week and I really don't like it in it's natural state. This will give me something to use it in. I've been using up lots of my other vegetables in cakes too - so my family won't be too surprised when this one pops up! Homesick ~ Stick around, 'unusual' things are pretty usual around here! Tanna ~ I won't steer you wrong more than once! Willa ~ Spread the Bread sounds wonderful. And whatever it takes to get more of us baking bread once in awhile. Ash ~ That's some vegetable bag. I also hear great things about a sauerkraut salad and sauerkraut soup, incl from Pille who commented above and might have recipes on her site. I must say, the title did cause me pause. But I've had the sauerkraut cake Willa spoke about and you really cannot tell it's in there. Oh, and thanks for the link to young Freddie. Cute blog! Thank you for sharing! This looks like a great recipe. Can't wait to make this at home. I've been wanting to try getting sauerkraut into more recipes!